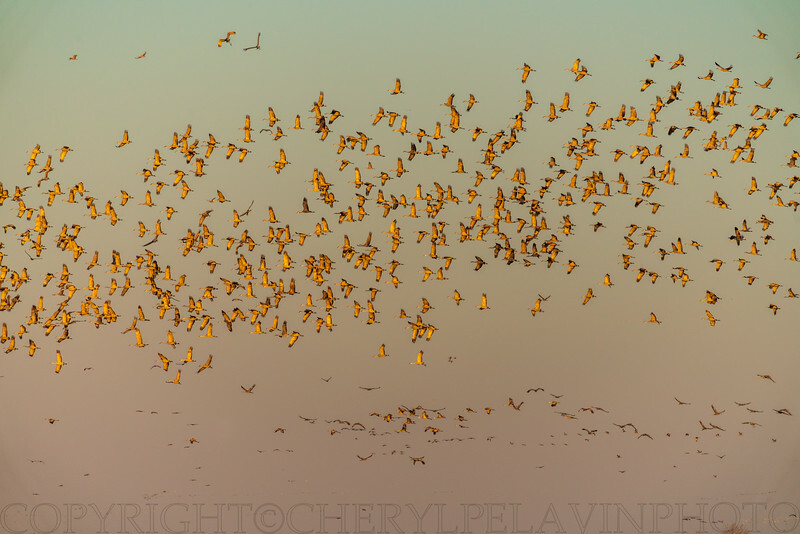 The Sandhills fly in ribbons of wings. 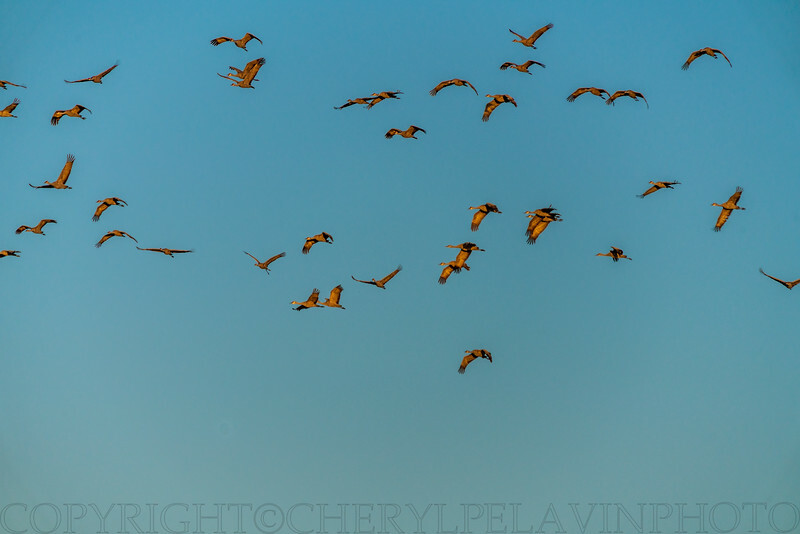 I purposely slowed the shutter to catch the cranes' movement. 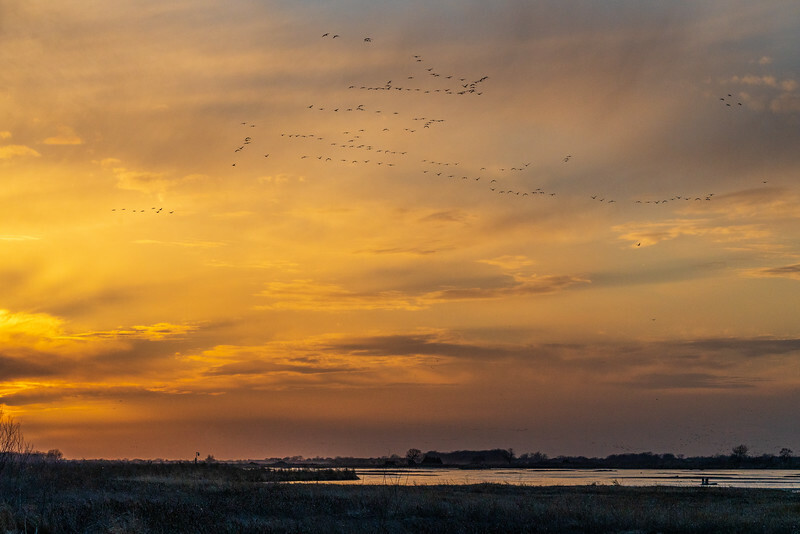 Sunset with lyrical ribbons of cranes over the Platte River in Kearney, Nebraska. 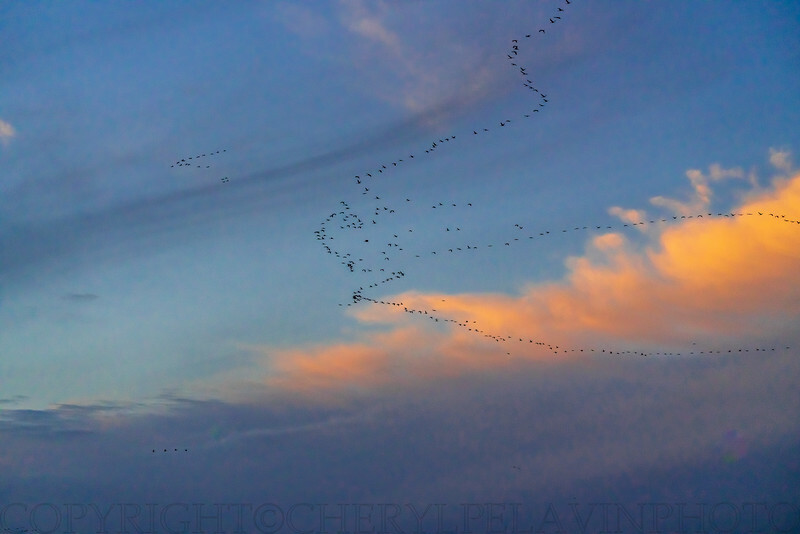 The cranes swing up matching what looks like a brush stroked sky. 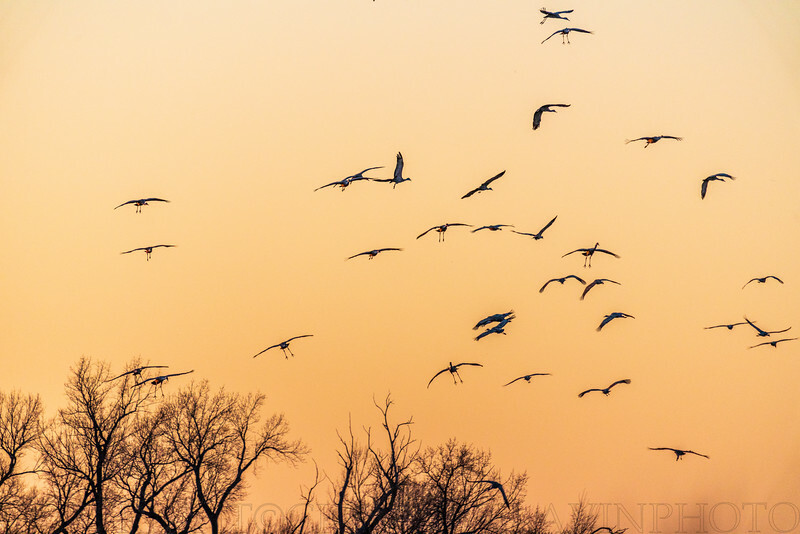 Cranes migrate in a "V". otherwise they are in a herd. This time I caught them in a line. 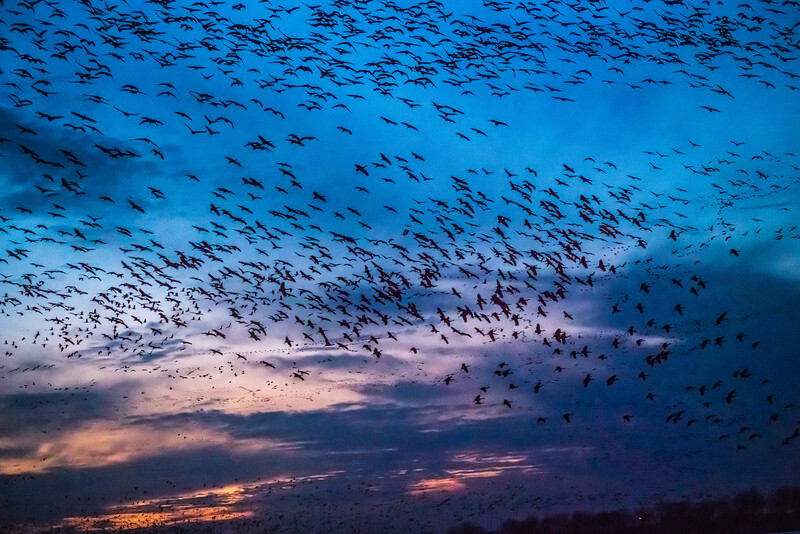 An awe-inspiring sunset filled with thousands of cranes heading for the Platte. 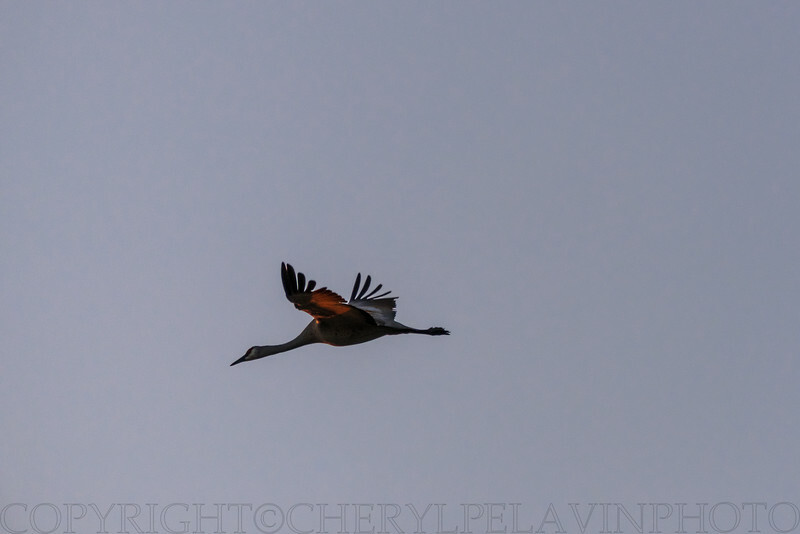 Because the crane is a large bird it moves relatively slowly. 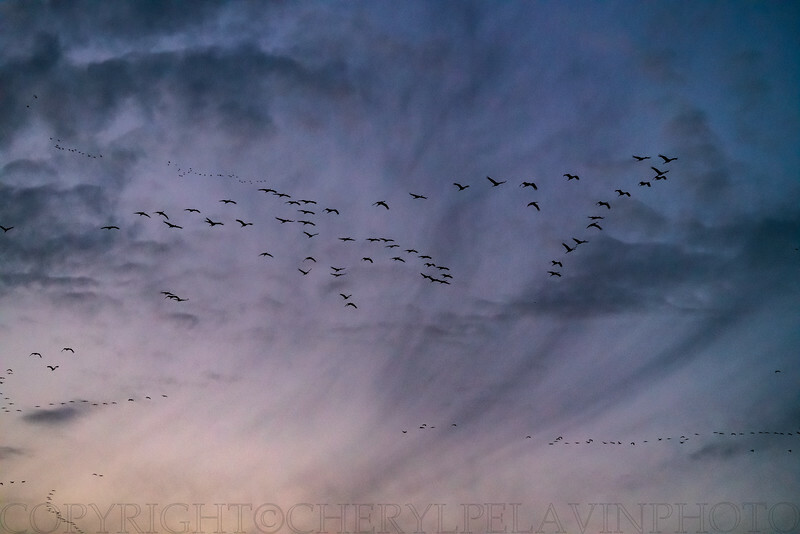 Slowing down the shutter allowed me to capture the path of their wings. All at once they are off! 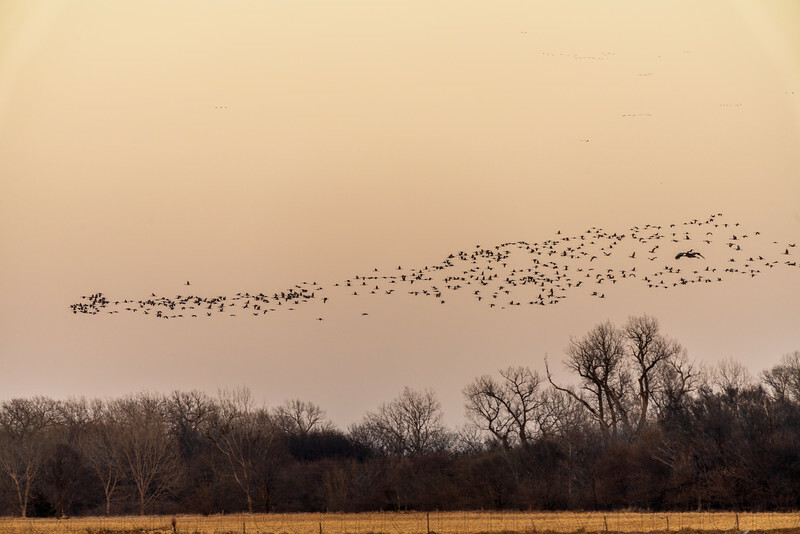 Just seconds before the river bank was filled with cranes, now they are a cloud disappearing over the horizon. 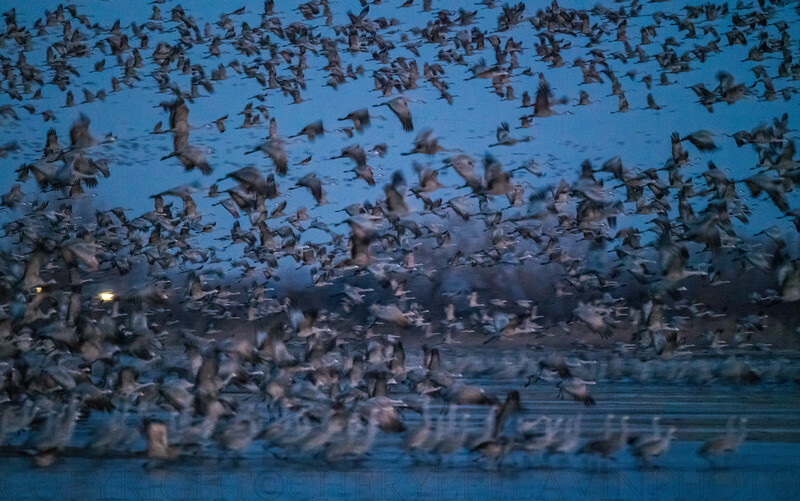 In the blue light of dawn the birds start to shuffle up and down the sandbank before take off. 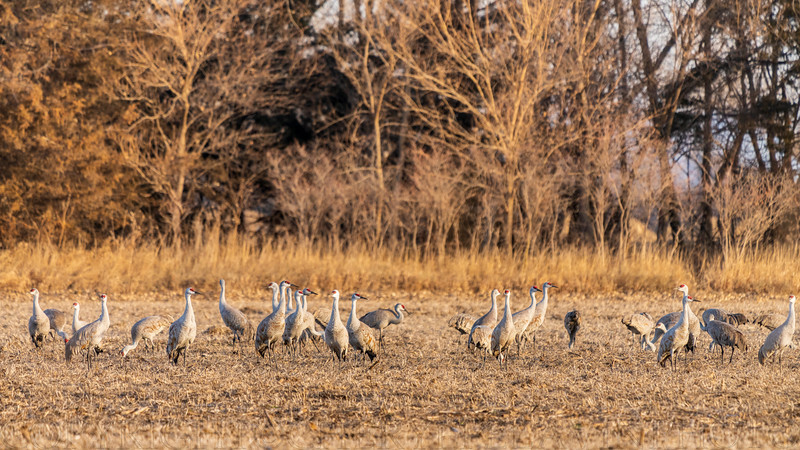 You can see how large the body of a Sandhill is in comparison to her tapering neck. The black flight feathers flip up as she glides. 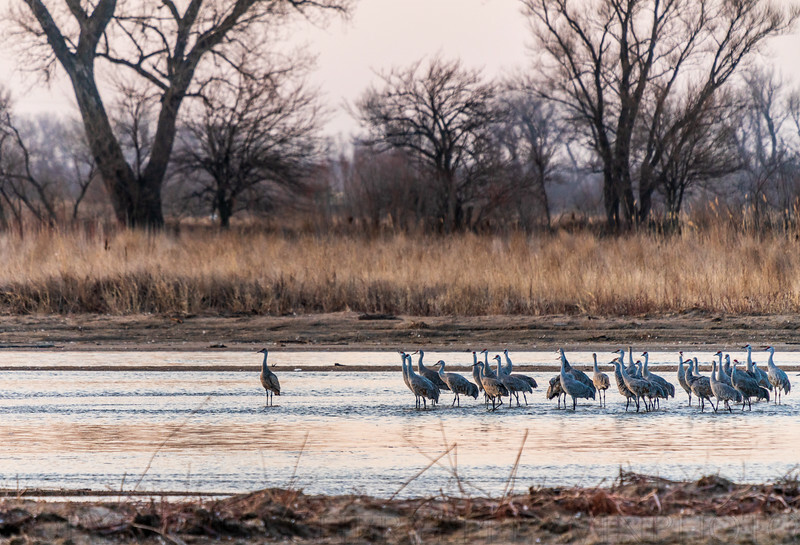 Sandhill Cranes over leafless March trees on the Platte River. For all of their grace and grandeur they make a comical picture when landing. 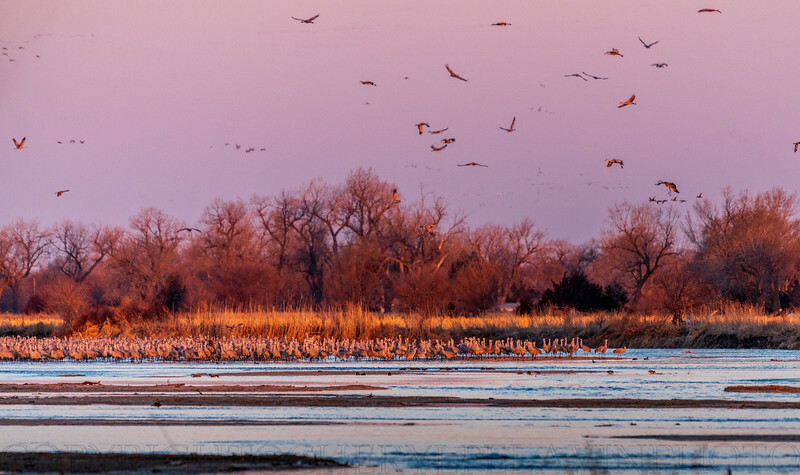 A truly golden dawn illuminates the cranes and grasses along the Platte River. 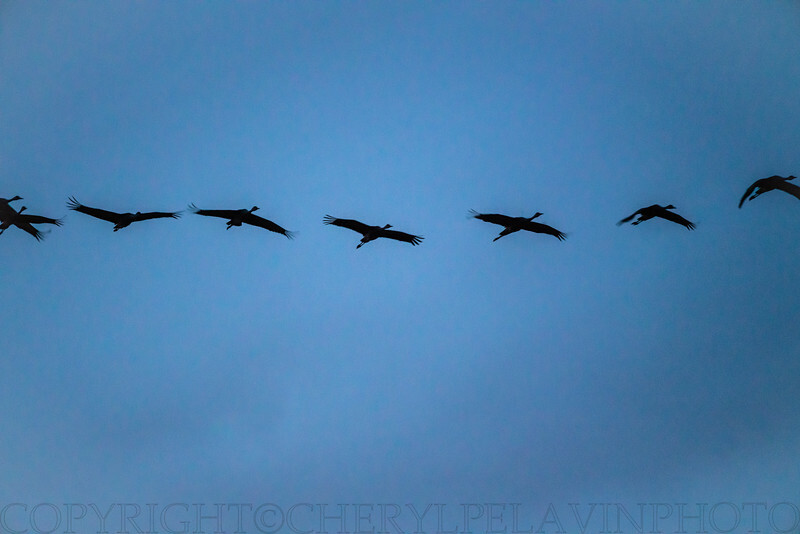 Winging and wheeling cranes in the early morning. 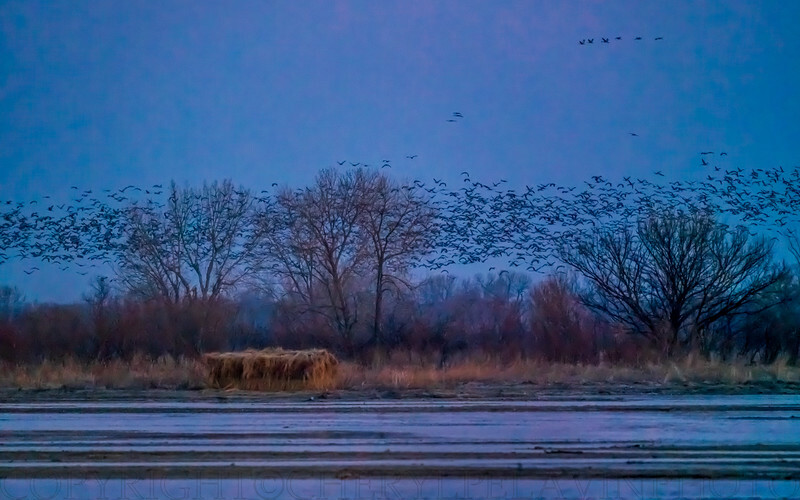 At first light a huge wheeling cloud of Cranes leaves the river. 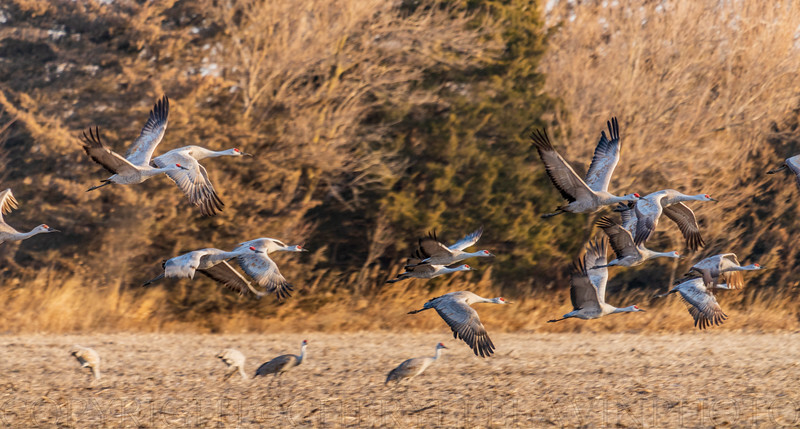 Crane bellies and wing undersurfaces reflect the light of the morning sun. I was struck by combination of blue and gold in this image. Together, these two colors go back to at least the Egyptians and were always used to represent the divine. Here is the irrigation that drains the Platte, that grows the corn, that feeds the cattle, that people eat. 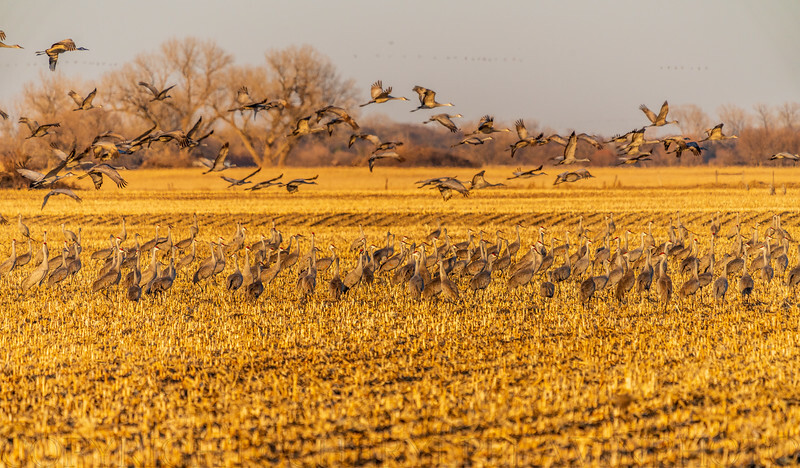 The cranes are lucky there is so much waste grain left on the ground. 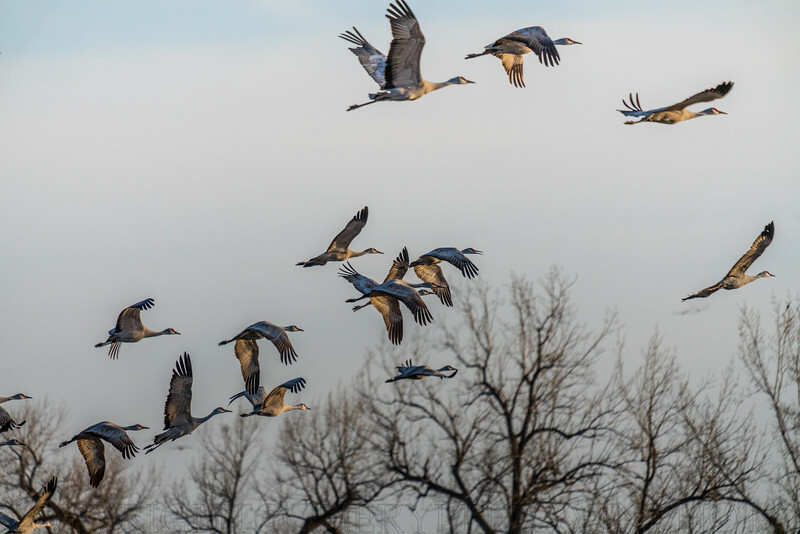 Cranes flying in a flock are called a "herd". 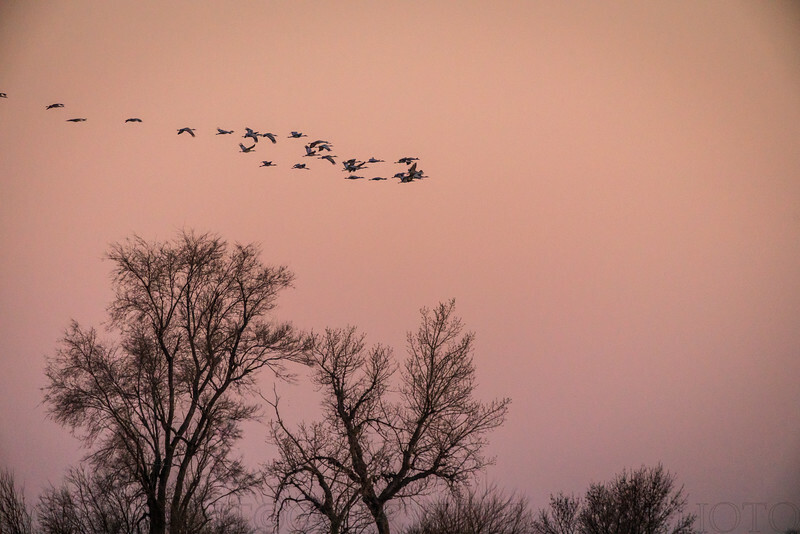 An hour before sunset the cranes start to head back to the river. 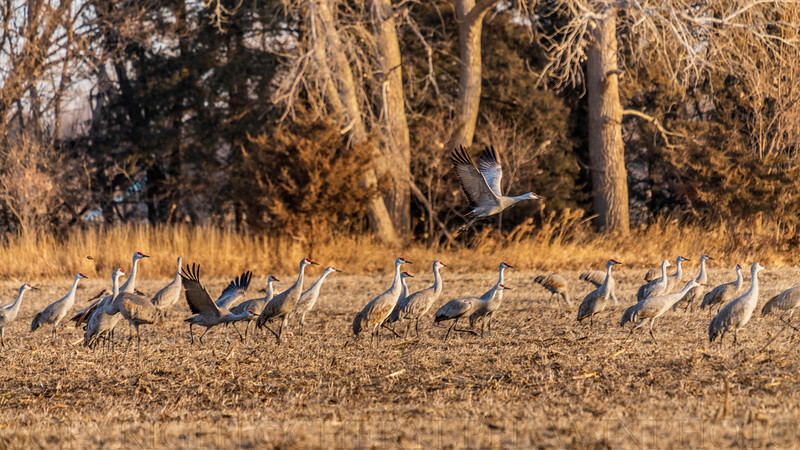 Cranes communicate a great deal. This is probably a squabble over standing rights. 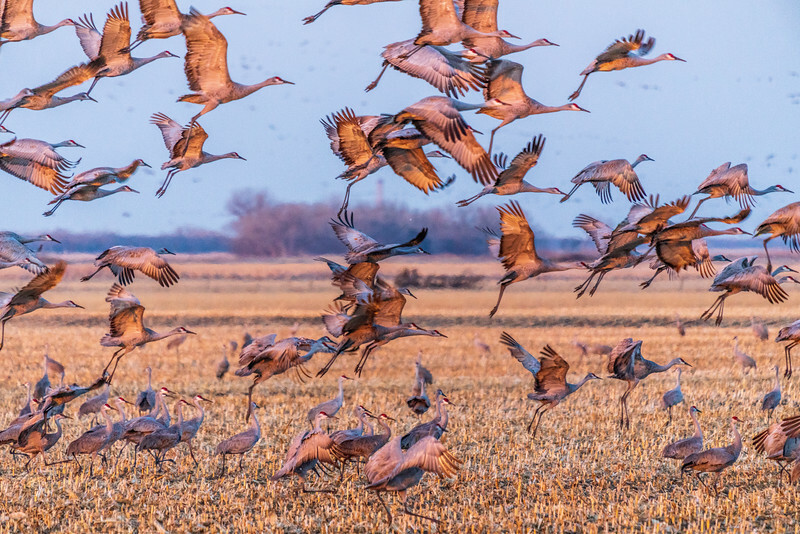 Cranes run forward to take flight. 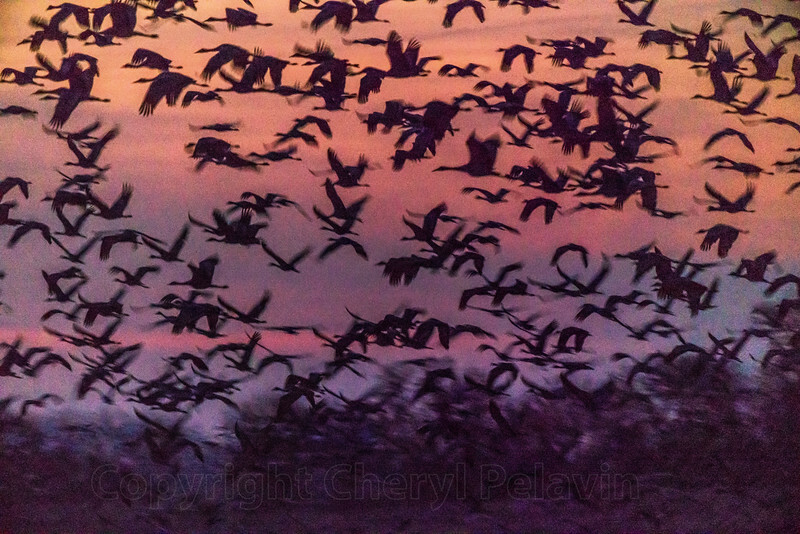 Here their gray feathers beautifully reflect the pink and blue of the sunset. 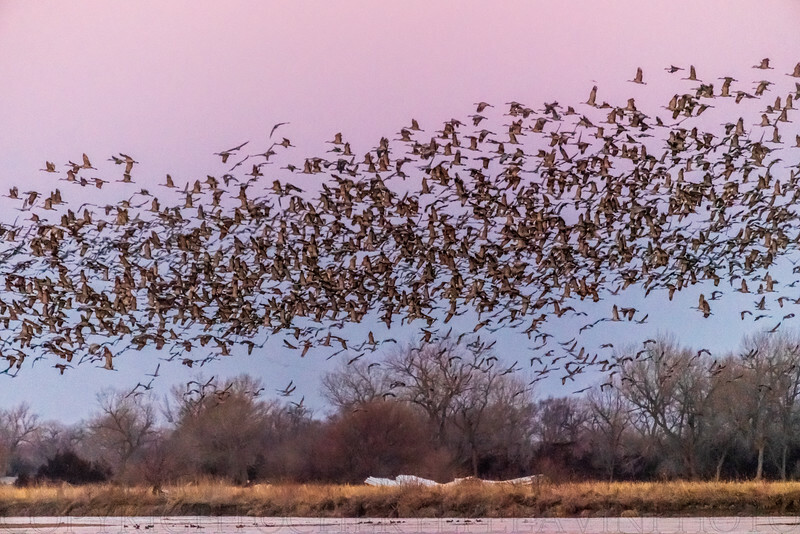 Some of the birds are caught in comical positions prior to the grace of flight. The afternoon sky was a dusty blue. 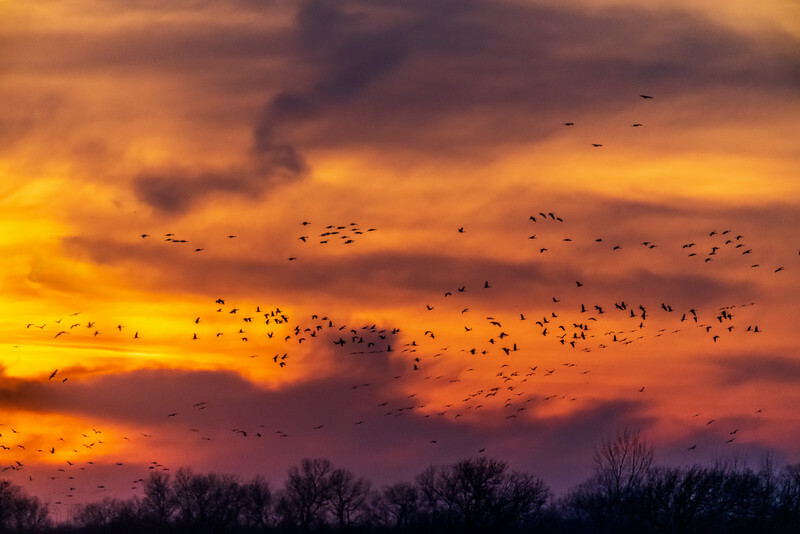 At twilight it lit up orange and purple with silhouettes of wheeling cranes. As the sun lights up the sky it reveals a crane metropolis. 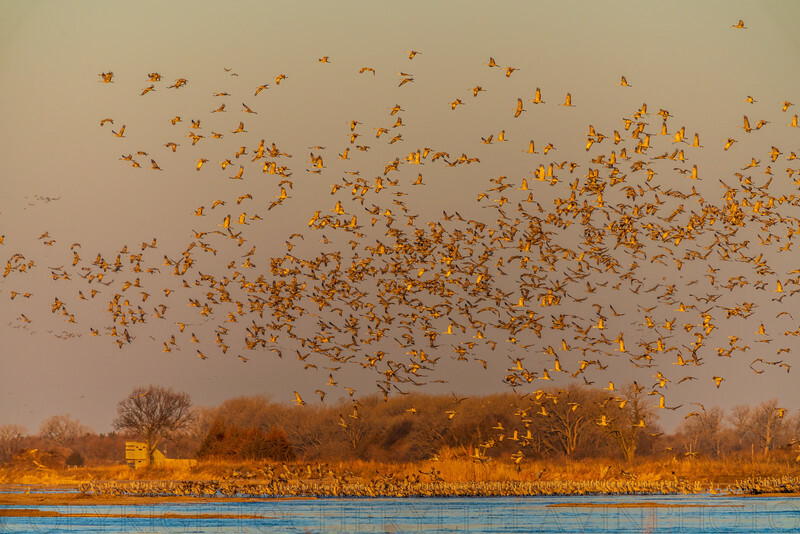 There can be as many at 12,000 birds in a 1/2 mile stretch of the Platte River. Just light enough to see individual cranes on the sandbank. 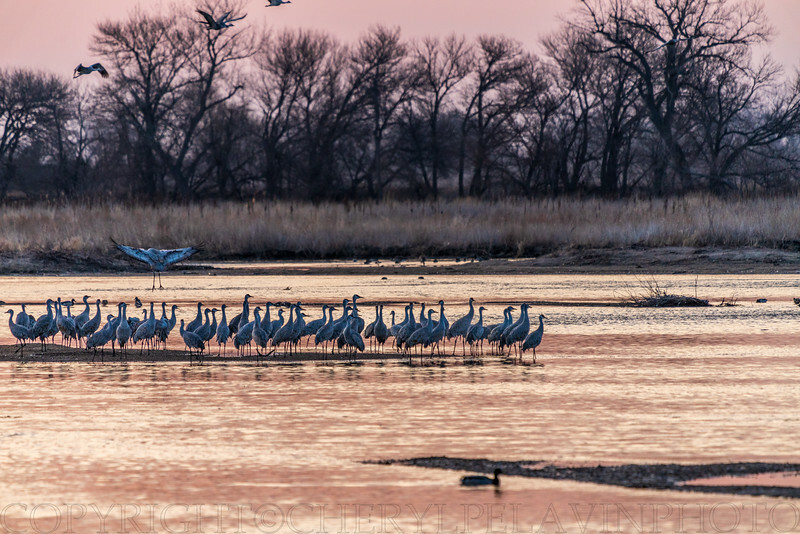 ON the left is a single crane, dancing. 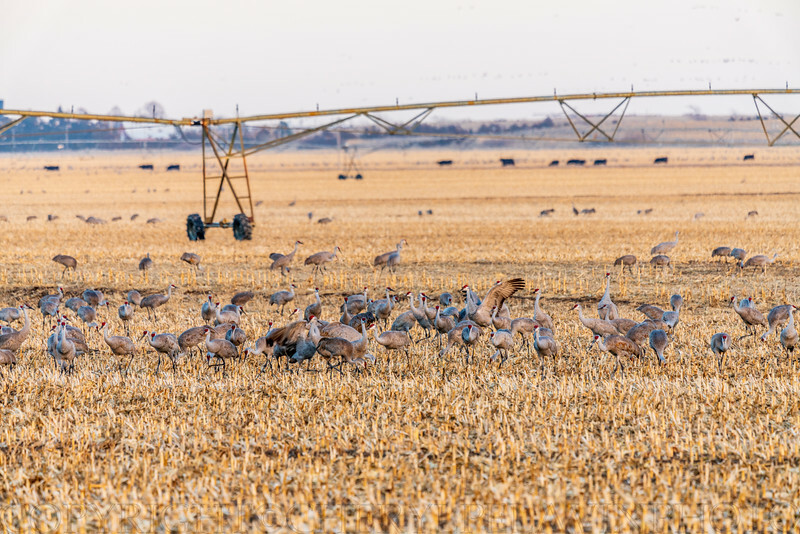 Sandhill Cranes prefer to stand in about 6 inches of water. There is actually a sandbank beneath their feet. 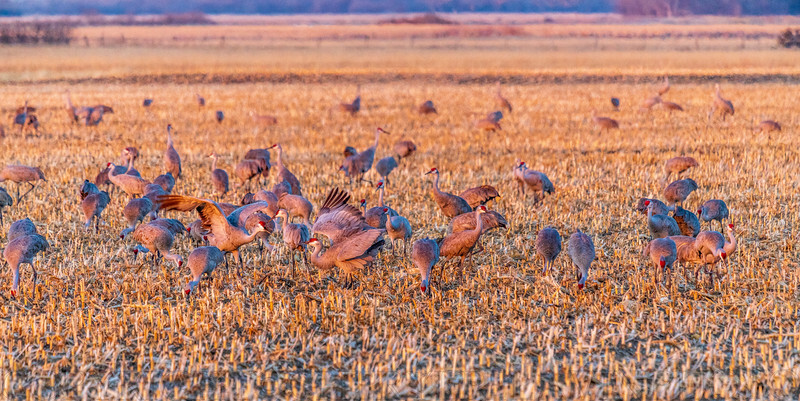 A lead or pair of cranes will signal take off for the others. 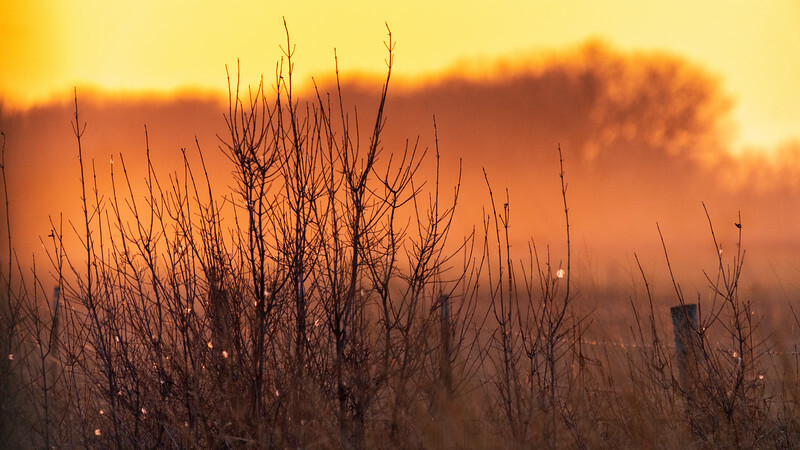 A feathered rush for the new day. 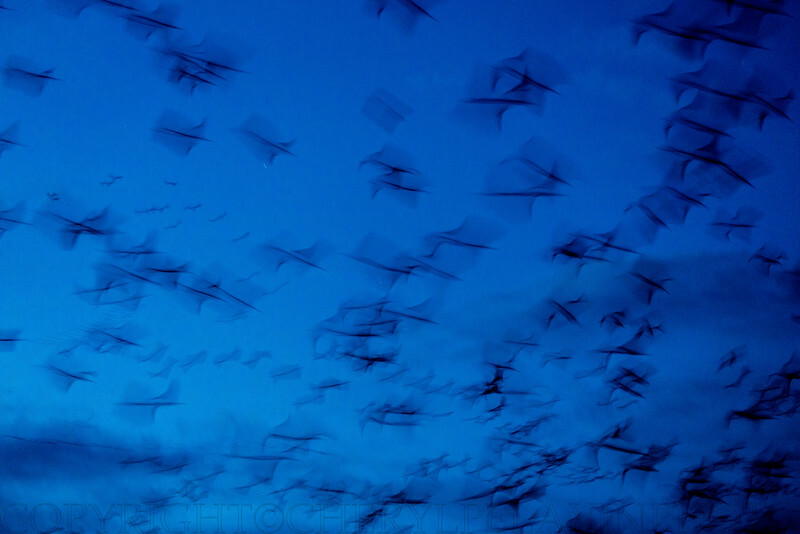 Another blue sky morning as the birds head for the fields. This was as close as my lens would allow me to get. They appear totally unconcerned with regard to our presence. 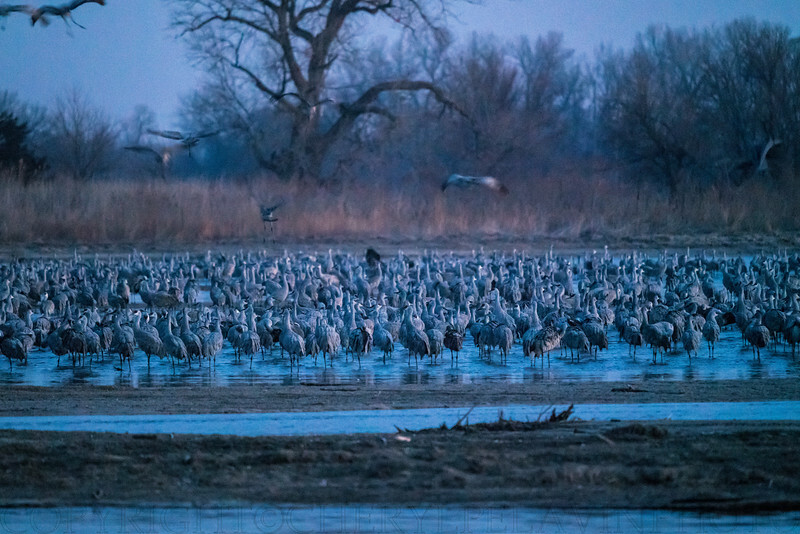 One morning the cranes failed to notice we were leaving the blind, so I caught this shot of them feeding right behind us. 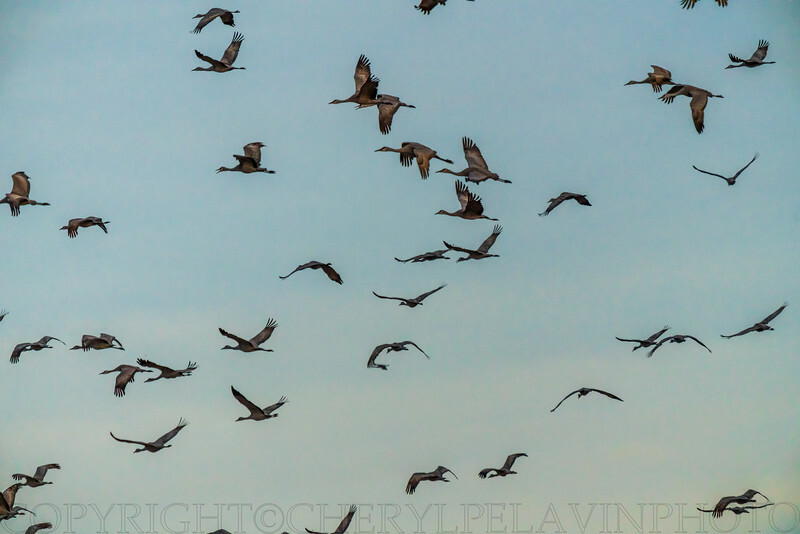 It was very exciting to see birds this large, fly by, right at eye level. Somebody caught on and they rush to leave. 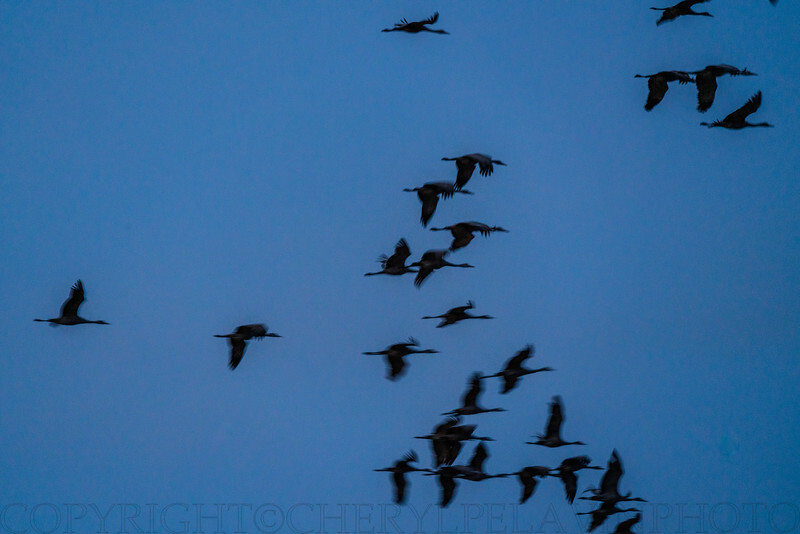 As they flew away I could only think of how much I wanted to come back next year.